Ahahahaha Tsubaki made her way back to the top of the Best Girl rankings last week just in time for this episode—awesome. Just my luck. I’m sorry, Tsubaki-chan. It seems I doomed you. The most heartbreaking thing about this whole situation, as is common, is that it was always inevitable. Kousei Arima, Tsubaki’s next door neighbor, never really lived in the same world she did, yet she fell in love with him anyways. But we always want most that which we do not have ourselves, right? Kousei brought that other world to Tsubaki by being small, by being weak, by being a crybaby who needed her, and by being her friend. He was, for a short, while just alike her enough for Tsubaki to find him attainable. And so, even after he begins to play, to get back on his feet, it’s hard for her to realize Kousei is no longer living in the same world she is, but has returned to the way of life where he belongs. It’s an impossible, unavoidable moment. 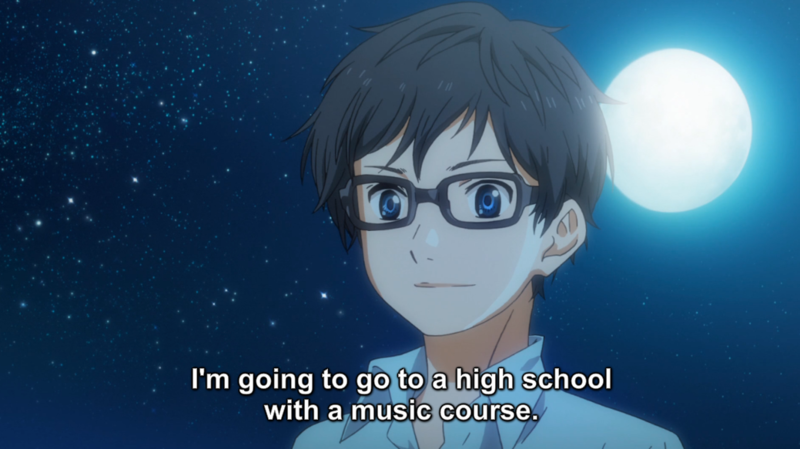 Kousei is a musician and a genius; Tsubaki, an athelete and a normal girl. 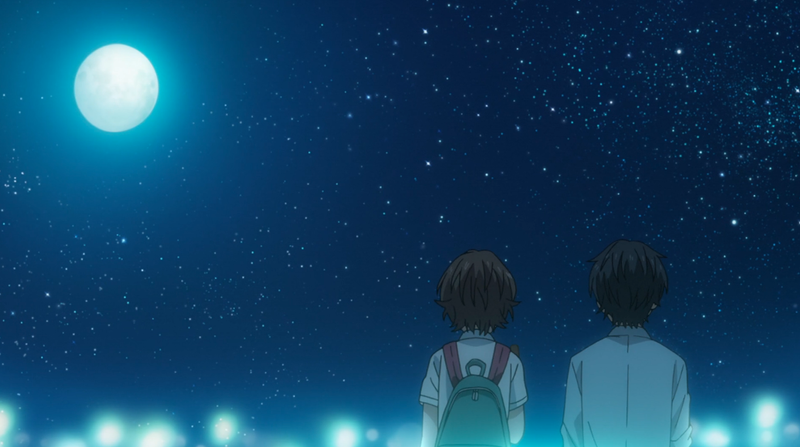 Their respective paths through life were always going to diverge and there was never any way Tsubaki could find her way onto the same road Kousei has to take. And he can’t turn back for her—to do so would mean to change the very essence of his nature as an artist. Having written all that, I’m starting to wonder if Kaori is actually something of a weakness in the show for me. 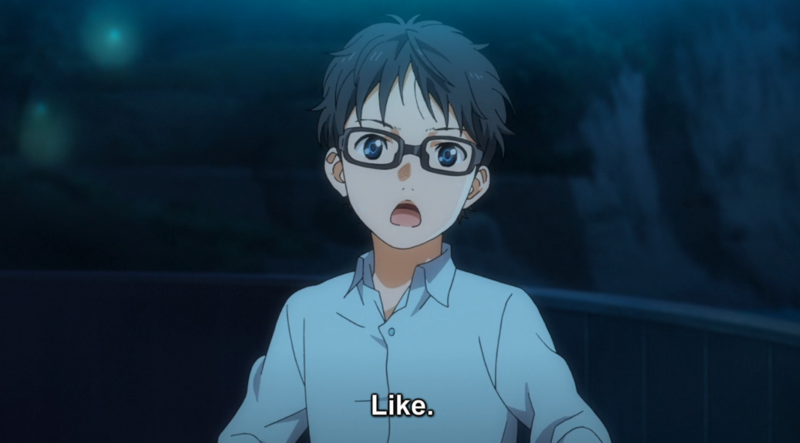 I’ve written my praises for Emi at length, talked a lot of Tsubaki and even Watari, and, of course, talked about Kousei. 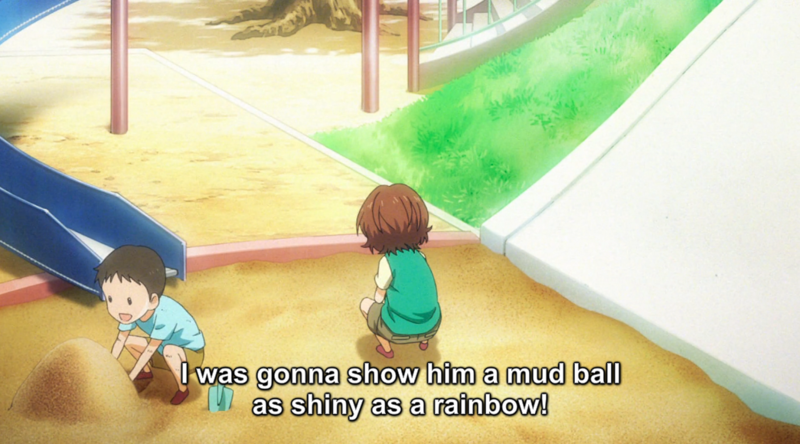 But everything involving Kaori for me, well…maybe it’s just that KimiUso‘s penchant to lay on the foreshadowing so thickly that it’s more like swimming through mud than trying to grasp shadows. In less ridiculously overstated terms, the extreme nature of the insinuations that Kaori is going to die has effectively sucked out all the tension from her character’s situation. This isn’t one of those cases where knowing what’s going to happen creates a sense of dread—KimiUso‘s insistence on incorporating humor into Kaori’s scenes alleviates that stress in scene and the foreshadowing has been going on for soooo lonnggg that it’s basically just a part of the setting at this point. Is there any pathos left in her situation? 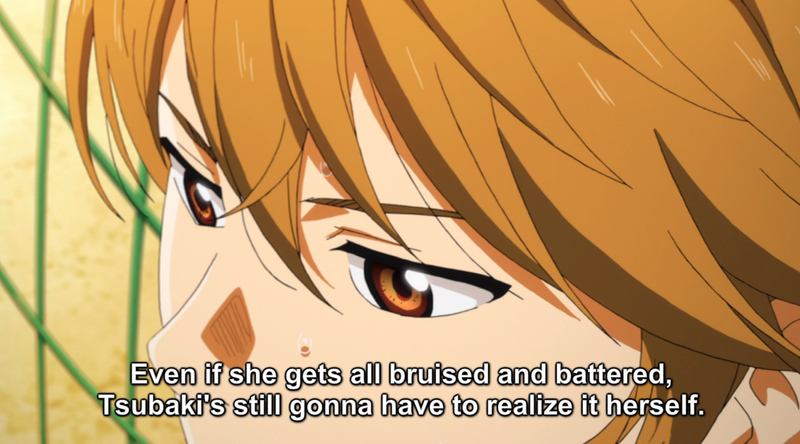 This isn’t to say that KimiUso in incapable of creating emotional resonance at any given time—heck, we just had a magnificent example of how the show can execute an impactful moment in this episode with Tsubaki’s breakdown. But we haven’t been allowed to feel the weight of Kaori’s circumstances, only get heavy-handed hints of what her situations is without getting to actually see it. 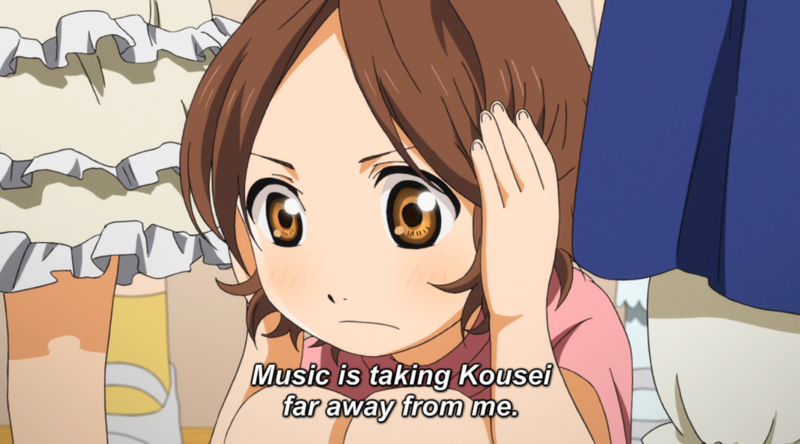 In other words, this is a classic case of being told, not show: “Kaori’s going to die! Kaori’s going to die!” I fear if the show continues to rely on foreshadowing only to built up Kaori’s death, the actual emotional moment might feel hollow. Now, of course, it could end up being another of KimiUso‘s trademark executional masterpieces, but the reason episode 10 worked so well was in part due to the fact that we had actually seen Kousei struggling with the chains he broke on stage. But maybe it’s all just because Kaori’s positive personality is so strong that it overwhelms the bits and pieces we get of Kousei’s fears. But all that’s tangential, anyways, to the main motions of this episode, which really was a Tsubaki episode more than anything else. 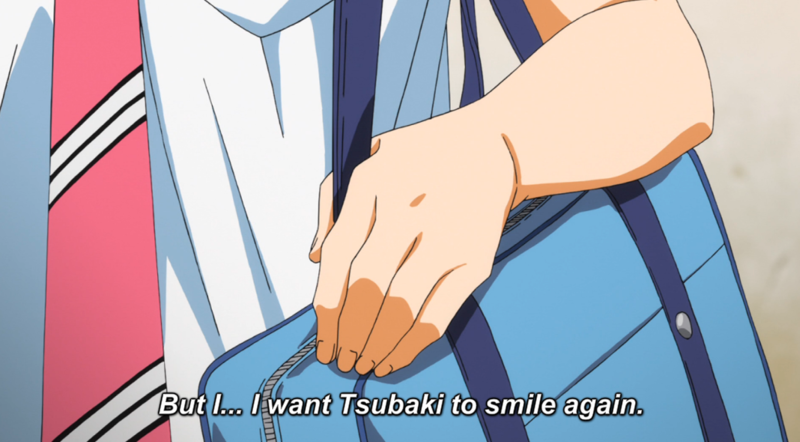 Kashiwagi seems to have decided to make it her personal project to get Tsubaki to realize her feelings for Kousei—”I want to see Tsubaki smile again“—so it’s nice to see Watari speak up for the value in Tsubaki figuring things out for herself. Kashiwagi, correctly, worries that Tsubaki won’t figure it out in time, but I think Watari’s point is well taken. Does it mean anything if Tsubaki doesn’t understand, really understand on her own? Will someone else telling her actually help her to realize what she wants? Will it matter anyways? For that matter, Tsubaki has lived through this before as a child—she’s seen music and Kousei’s inherent talent for it sweep him away from her, out of her dirty, mud-stained reach the sky of music. Tsubaki can’t fly. 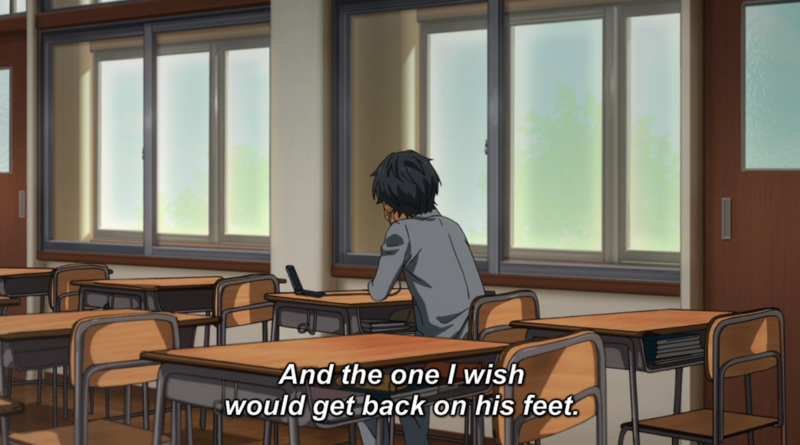 All she can do is stand on the same earth and Kousei and push him forward. The bitter irony is that Tsubaki’s feelings for Kousei are, although she couldn’t realize it until now, at war with each other. She both selfishly wants him to stay by her side forever, yet also unselfishly loves to see him doing what he was meant to do at the piano. She wants him back on his feet, never realizing that in pushing him back into the world of music, she’s pushing him farther from herself. Literally, it’s Tsubaki’s words to him that cause him to realize where his path in the world is—and leads directly away from her. What a crushing blow for someone as young as Tsubaki to inflict on herself. Adults, maybe, can hurt themselves like this for someone they love, but for Tsubaki…how could she possibly understand the fundamental separation between the way she and Kousei live in the world? How could she ever be prepared to handle the understanding that the thing she wants most for Kousei—his healing and his ability to live—is the one thing that stands, impossible to overcome, between her and him. Someone with as much love as Tsubaki never deserved something like this…but that’s just how it is sometimes. 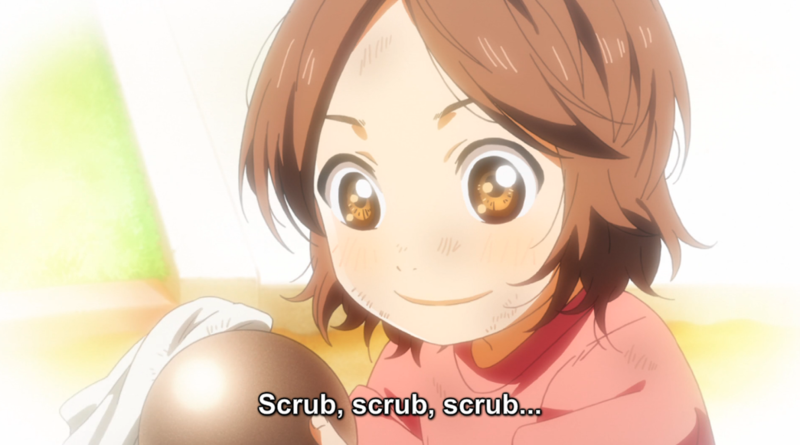 The really interesting thing for me now is what KimiUso is going to do with Tsubaki after this. I desperately hope we don’t see a repeat of Inou Battle episode 7, where Hatoko had an amazing vulnerable moment in front of Andou and then proceeded to be sidelined and dismissed. 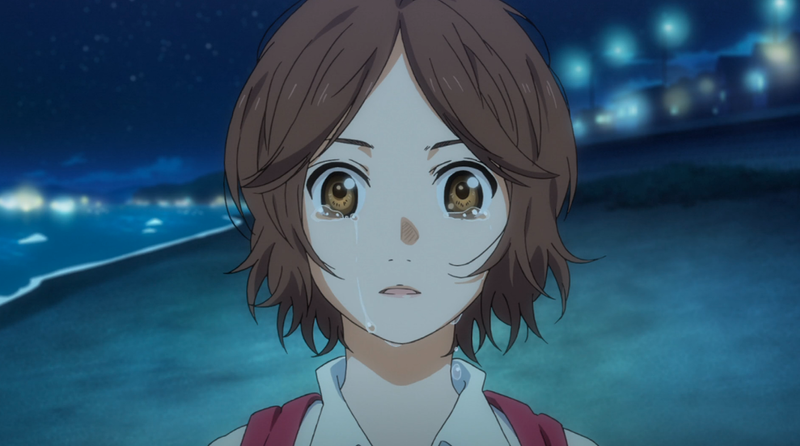 I hope KimiUso isn’t so cruel as to deal with Tsubaki in the same way. I hope Kousei chases after her. I hope he’s a good friend who refuses to give up until she tells him why she ran off crying. And I hope, more than anything, that somewhere Tsubaki can find something to heal her broken heart. I doubt that will happen, so far the show hasn’t looked like they threw aside any conflict or whatever before properly dealing with it, I also think that applies to Tsubaki. Maybe the focus will be on something else, like we saw in the preview, but I expect her to be back soon. Well…Emi was kind of tossed aside after her arc, so…I’m worried about how the show is going to treat reigning Best Girl. To be honest, even the show focus going elsewhere next episode (Inou Battle did that too—as if we’d forget!) would count as the same thing for me. Tsubaki deserves to have the immediate drama to be resolved, even if that means us hearing that she’s locked herself in her room and won’t come out. 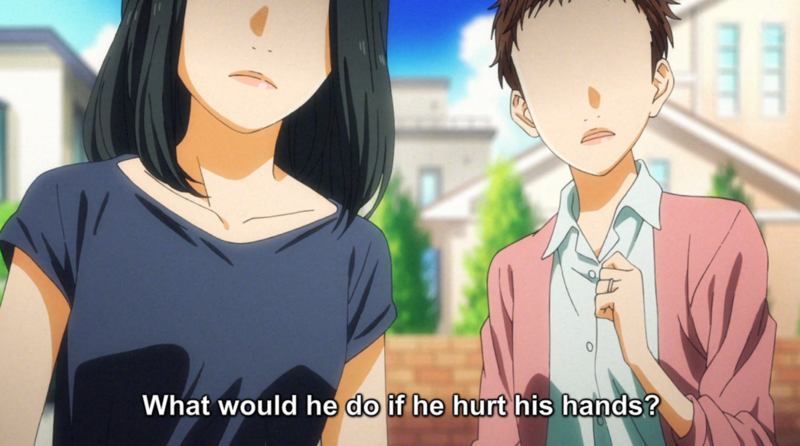 But, you’re right, KimiUso wouldn’t do that to us. Right? Right? Maaaaan…. to think that there’s a teen love drama that could touch me… either this one is one of the few, or my standard and credibility is slowly degrading. But, I’m pretty sure it’s the former :3 I mean, that last picture in your review is kinda… touching and the insert song fits so darn well, it give me the feel. 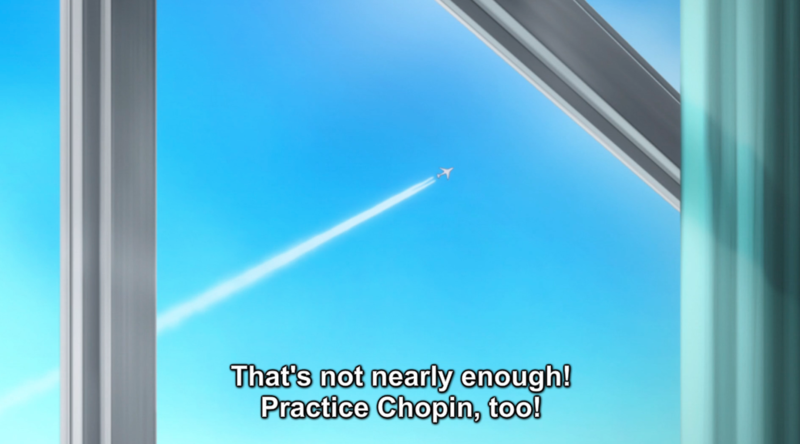 Now, talking about Kaori, yeah this show is hammering to you her death flags. Embrace yourself, this is just the beginning… more is coming. Having that said, I think I ever said this somewhere, but her death is actually essential for Kousei’s growth. Kaori is a “test” for him, whether he can grow and “learn” from loss, or swallowed by it like when with her mom. About the death flags… well… they’re a darn lot to the point one can be bored by it. There’s still a saving move, though. Everything lies in execution. One can execute a very compelling “death scene”, despite the viewers have been fed by the knowledge of that “death scene” itself. 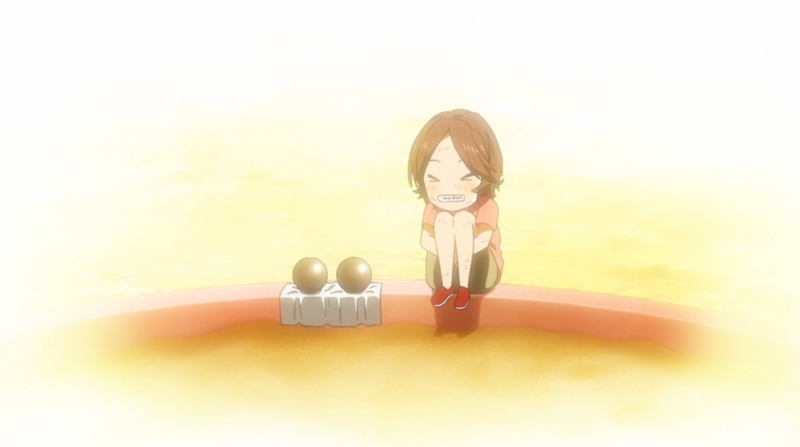 Yeah, that last image of little Tsubaki grinning over the two mudballs was more devastating than any shot of her bawling her eyes out could have been. It was a brutal irony representing almost the entirety of their relationship up to this point and her love for Kousei—juxtaposed right after the images of her current self crying…ugh, it was killer. As for Kaori’s death, I honestly might end up kind of hating the show is Kaori is only here to die for Kousei. It just seems like such an awful, simplistic way to use a character, especially when its been as clumsily set-up as her death has has been. I have no doubt the actual execution of her death and Kousei’s subsequent misery will be supremely effective and incredibly emotional, but in the wider context of the show I fear it will essentially just be one more plot point. It’s not a stretch to say music is important in this show. I can’t help but wonder about the happy few moments walking on the beach leading up to Tsubaki’s running off. They’re both humming Clair de Lune…together. This is a piece we gather Kosei has been practicing and Tsubaki overhearing next door. Was this just to underscore the moonlit night? To set us (and Tsubaki) up only to knock us down? Or will this piece of music figure going forward? Clair de Lune is at once so bright and so warm. Was it simply a throwaway? 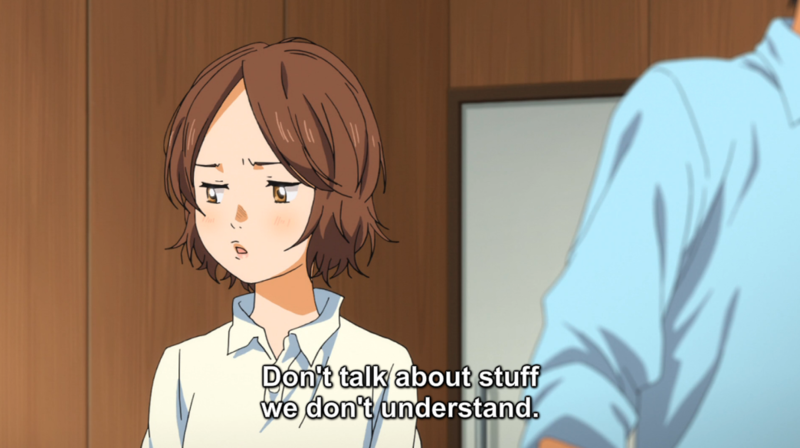 I think it was an effective way to show how Tsubaki kind of vicariously lived in Kousei’s world through listening and how hard she’s tried to understand his world (remember her line this episode about “don’t talk about things we don’t understand”?). Even though she’s never been able to inhabit the same world as Kousei, she’s tried hard to do so. And it was a bright, warm moment! A moment when Tsubaki was able to be comfortable and content with Kousei—further serving to emphasize just how far apart they really are when Kousei tells her his high school plans. Excellent episode… they do so well when they concentrate on storytelling rather than being overly clever and literary. Poor Tsubaki. Poor Kosei. Poor Kaori. 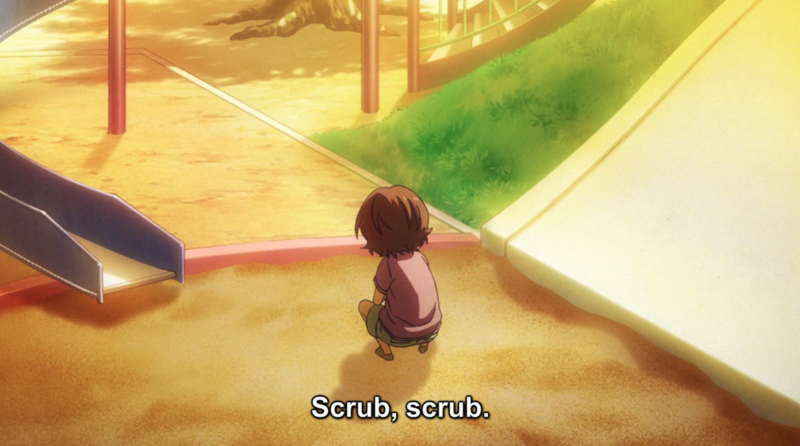 Watari, you had a rare flash of insight there, but you’re still a jerk. My thoughts so far (this is sort of stream-of-consciousness here, so it’ll probably be very long and a bit scattered). Initial impressions: Very enjoyable and entertaining, definitely likes to go big and dramatic. The introspections and flashbacks can get a bit overdone sometimes, but it’s never boring. Unique, interesting art style. Generally like the OST, although it can be surprisingly understated at times, especially for a series that focuses so much on music. Probably a 7/10 on my scale at this point, and I’m definitely going to keep watching. On the topic of Kaori’s death flags – foreshadowing can be a very effective tool for that kind of plot point, but there’s a fine line to tread, and like you I’m afraid they may have overplayed their hand. There are only two anime series that I have ever seriously cried over – not just getting damp eyes for a minute, but actually watching entire episodes with tears pouring down my face from beginning to end. One was Kanon, and the other was Yuki Yuna, and they had two things in common. One, I loved the characters in both shows and was fully invested in what was going to happen to them. And two, both shows used foreshadowing masterfully to set their stages. They offered just enough to get you anticipating what was going to happen, then pulled back and simply let your imagination and empathy for the characters take over from there as the scenarios played out. Although I like KimiUso’s characters, I don’t feel emotionally invested in them, and I think that’s partly because the entire series is dripping with melodrama; the plot and the visuals are so emotionally draining all by themselves that I don’t have enough left to put into the characters. That’s another thing about Kanon and Yuki Yuna – they both gave you plenty of down time and light character moments between the heavy dramatic scenes to let you catch your breath, and they also did a much better job of integrating their comedy seamlessly into the story, without KimiUso’s sometimes awkward transitions and tonal shifts. There’s one other anime I watched recently that I’ve been comparing this to, but for completely different reasons, and that’s Angelic Layer. 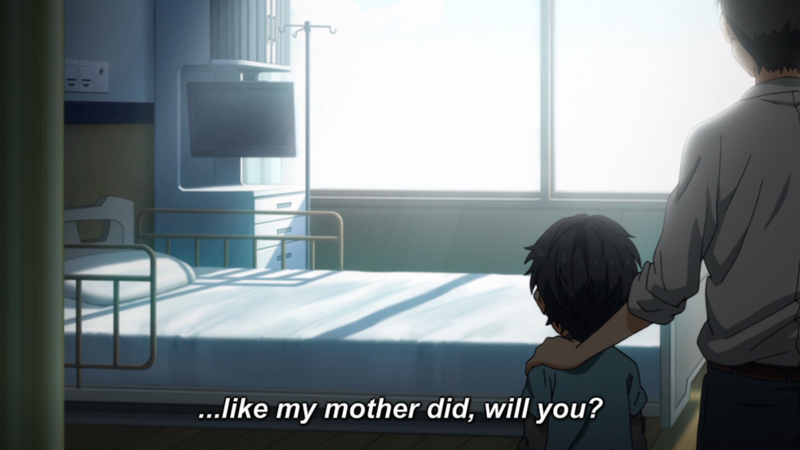 The connection is that both main characters, Kousei and Misaki, have very ill mothers, and in both cases that illness drove their mothers to make desperate decisions that left their kids with some serious emotional scars. We saw what Kousei’s mother became in her zeal to prepare him for life after her death. In Angelic Layer, Misaki’s mother has a progressive paralysis and left home on a flimsy pretext because she’s ashamed of her daughter seeing her turn into an invalid (she had another more practical reason too, but that was the big one). Now Angelic Layer is a battle shonen first and foremost, so while it also explores some of the same territory as KimiUso like competitive rivalries and middle school friendship dynamics, it doesn’t delve nearly as deep into its characters’ psyches. But it’s still obvious Misaki misses her mother terribly and is deeply hurt from being (effectively) abandoned, even though she puts up a brave front. Both shows also make it equally clear that the respective mothers made bad choices, even if their intentions were good. I can’t help thinking that Misaki might have it even worse in some ways, though, because she’s stuck in limbo waiting for a reunion that may or may not ever happen. 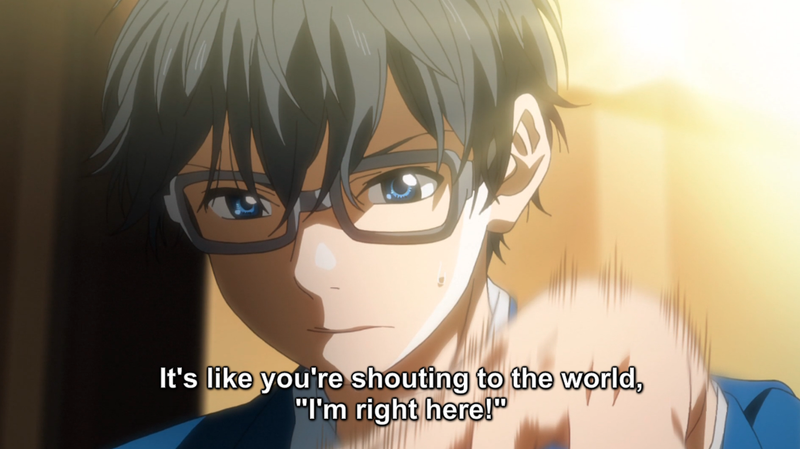 At least Kousei knows his mother is gone and has a chance to find some closure – the scene in episode 13 where he finally breaks down on Hiroko’s shoulder and expels some of that poisonous grief that’s been clogging him up for the last two years was one of my favorite scenes in the series so far. 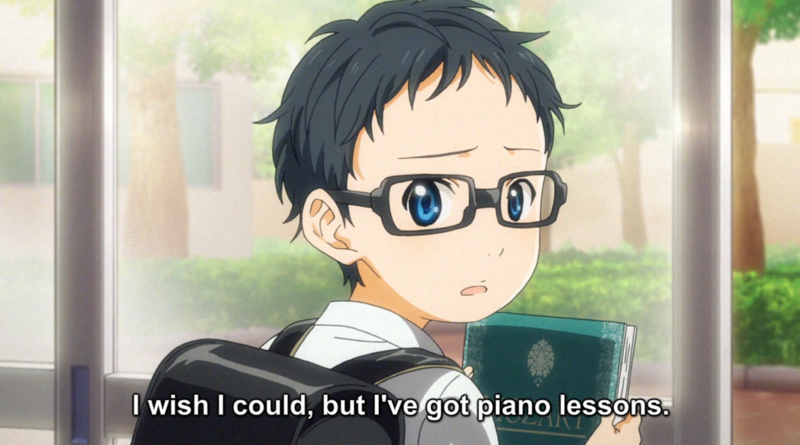 On a personal note, I studied piano for seven years, so I really appreciate the series on that level too. I was never interested in competitions or anything like that (I hated giving public performances), but I actually had an elementary school classmate who was another Kousei. Brilliant pianist, one of those kids who get writeups in the local paper at age seven, and his performances were always the highlight of every school talent show. He’s also one of the lucky child prodigies who didn’t burn out; he’s gone on to have an extremely successful professional career. And yeah, like Tsubaki, we all knew from early on that he was headed down a totally different path from the rest of us. I haven’t talked to him since sixth grade, but I still keep an eye on his CD releases and his performing schedule. Erm, yeah, I figured this was going to be long. Sorry, hope you don’t mind! Welcome to being up to date! No worries about the length! I like reading your thoughts! Although I like KimiUso’s characters, I don’t feel emotionally invested in them, and I think that’s partly because the entire series is dripping with melodrama; the plot and the visuals are so emotionally draining all by themselves that I don’t have enough left to put into the characters. That’s a really interesting way to think about—not sure I’ve heard anyone raise that point before. 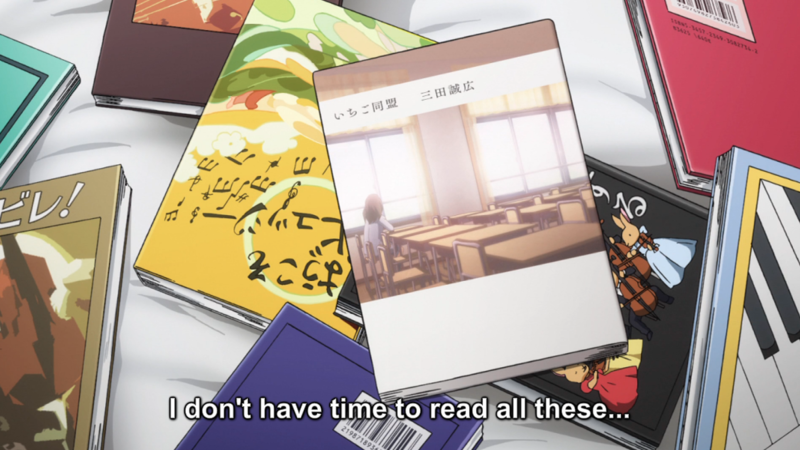 I know I have some investment in a few characters (Tsubaki and Emi primarily, some with Kousei, and a little with Watari), but I do agree with you that everything else is so draining that it’s almost like the characters are non-essential to the overall intentions of the show. Obviously, they inform the plot, but sometimes it does feel like conveying emotion is the primary goal of the show, rather than conveying a story. It’s always cool to see a show accurately reflect some of your own life experiences, especially with something as personal as music. I played piano myself when I was younger, but never anywhere close to the type of playing that happens here. AKB0048 hits much closer for me because it reflects a different kind of experience. And agreed, the OST has some hits and misses (although when it hits, it really hits). Glad you’re liking it! Hope to see you around in the comments for the rest of the show!